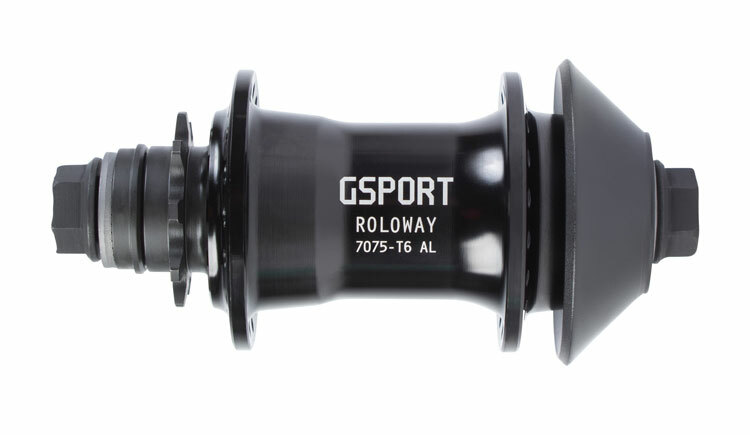 Whenever GSport drops a new hub, you know it’s going to be high quality. They have just released their new Roloway Cassette Hub for you to check out. This hub starts out with a 7075-T6 aluminum shell that has a modern and slim shape with 16003 Sealed Cartridge bearings , a 4130 chromoly female axle with 14mm 4130 chromoly axle bolts and a 9-tooth, 3-pawl driver with an independant spring design and precision caged needle bearings to keep things rolling smooth. The Roloway Cassette comes with a replaceable plastic hub guard and is designed to be left or right hand drive switchable which means you can change the drive side without needing a new driver. The Roloway Cassette Hub is available in Black and Polished colors with a weight of 16.9315 oz. and a price tag of $184.99! The hub can be picked up through BMX shops and mail-orders that carry GSport worldwide now. What do you think of the Roloway Cassette Hub? Do you have any questions? Let us know what you think in the comments below! Check out the Roloway Front Hub! Not quite what you are looking for? Check out more BMX Hubs! Check out this short but sweet commercial from Demolition Parts! Demolition Parts coming through with a quick commercial for the Ryan “Biz” Jordan signature RotatoR V3 freecoaster hub! Ryan gets his fakie on through a few spots and even thinks about El Toro for a second… Take a peek!